union to significantly strengthen economic regulation of major European airport monopolies by focusing on the interests of passengers. Enforcing greater cost-efficiency at Europe’s airports will feed through into cheaper air fares, stimulate travel and enhance European competitiveness. In turn, this will support jobs and grow the economy. Had airport charges remained constant over the 2006-2016 period consumers could have benefitted, on average, 17 Euros per one-way trip. That price stimulus of nearly 10% of average tickets costs would have improved Europe’s competitiveness, and potentially generated an additional 50 million passengers. In turn that would have unlocked 50 billion Euros in European GDP and created 238,000 jobs. “Airlines, like all competitive businesses, are in a constant struggle to improve efficiency. Europe’s airports however are largely insulated from competitive forces. Europe’s light-handed Airport Charges Directive has failed Europe’s travelers and its own competitiveness by letting airport charges rise. Tighter EU regulation is needed to stop airport monopolies from taking money from the pockets of travelers to reward investors. The goal should be economic regulation of airport monopolies that is an effective proxy for competition—promoting efficiency while protecting consumers. In that regard the voice and interests of airlines – airports’ main customers – should be carefully listened to. This will ensure effective regulation that will broadly balance the interests of travelers, investors, citizens and economies,” said Alexandre de Juniac, IATA’s Director General and CEO. The trend of increasing private ownership of European airports adds urgency to the situation. Since 2010 the number of European airports in private hands has almost doubled. “In many cases privatization has failed to deliver promised benefits to passengers and the local economy often suffers the results of higher costs. The balancing role of effective and strong economic regulation is essential,” said de Juniac. 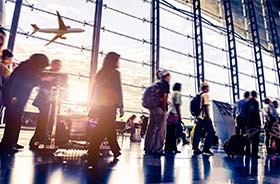 In its Aviation Strategy, the European Commission has rightly identified the need to boost the efficiency of airport services and has engaged in an assessment of whether and how the Airport Charges Directive needs to be reviewed. IATA fully supports the urgent finalization of this assessment under the leadership of Commissioner Violeta Bulc and of her team. (1) The all-in nominal average cost of a one-way air ticket (including all charges and ancillary fees) departing an EU 28 airport remained roughly constant (rising 2% from EUR 216 to EUR 220). Adjusting for inflation, the real cost of air travel fell by 8% in real terms over the same period. (2) Average airline revenue per passenger fell from EUR 194/passenger to EUR 173/passenger. (3) Airport charges doubled from EUR 16/passenger to EUR 33/ passenger and passenger taxes also doubled from an average of EUR 6/passenger to EUR 14/passenger.